In recent weeks, President Donald Trump has repeatedly indicated that he intends to pressure Israel to make yet more concessions to the Palestinian Authority. I wonder why pro-Israel voices have not been expressing concern about this development. I admit that his rhetorical swipes at the P.A. have been a welcome change from the "see no evil" policy of his predecessor. U.S. Ambassador Nikki Haley's speeches at the United Nations have also been terrific. And the administration's recognition of Jerusalem as Israel's capital was gratifying, although it's still puzzling why it should to take two or more years to set up an American embassy in Jerusalem when the building already exists. These positive verbal and symbolic flourishes will not count for much, however, if the current administration returns to the old pressure tactics that were unfairly used against Israel for so many years. We all remember the Trump-Netanyahu press conference a year ago, on Feb. 15, 2017, when the president said: "I would like you to hold back on settlements for a little bit." Many of us wondered why. Jewish settlements in the historic Jewish homeland are peaceful, legal and deeply anchored in the Judeo-Christian heritage cherished by Israelis and Americans alike. Not only that, but settlements have nothing to do with the Israeli-Arab conflict. The Palestinians and other Arabs were waging war against Israel long before there were any settlements at all. They waged war before the Jewish state even existed. The idea that "holding back" would promote peace is utter nonsense. And what, exactly, did President Trump mean by "a little bit"? Weeks? Months? Years? How long should basic Jewish rights be "held back" in order to appease a regime that glorifies terrorists, and incites hatred and violence against Jews? In recent weeks, there have been more worrisome signs. In a tweet on Jan. 2, the president wrote: "We have taken Jerusalem, the toughest part of the negotiation, off the table, but Israel, for that, would have had to pay more." He used similar language when speaking to reporters in Davos on Jan. 25: "I helped it because by taking it off the table--that was the toughest issue--and Israel will pay for that. You won one point and you'll give up some points later on in negotiations if it ever takes place." Why in the world should Israel have to "pay" for the U.S. decision to recognize reality? The Trump administration simply did what previous presidents should have done. And what's this about "giving up some points later on"? Ever since the signing of the Oslo accords in 1993, Israel has been giving up, and giving up, and giving up some more in its dealings with the Palestinians. Israel gave up the historically Jewish and strategically important Gaza Strip. It expelled more than 8,500 Jewish residents who had called Gaza home. In exchange, Israel has had thousands of rockets, missiles and mortars launched against it. Israel gave the P.A. control over 40 percent of Judea and Samaria. Israel let the P.A. build a security force that serves as a de facto army. Israel released hundreds of terrorists as "gestures" to the P.A., even though many of them then returned to terrorism. Yet in an interview with Israel Hayom on Feb. 9, President Trump said: "I think both sides will have to make hard compromises to reach a peace agreement." Until now, only one side, Israel, has been making all the significant compromises. It should not be expected to give up even more. The old moral-equivalency thesis--that both sides are guilty, and both sides must make "compromises"--is a timeworn falsehood. It deserves to be consigned to the dustbin of history. 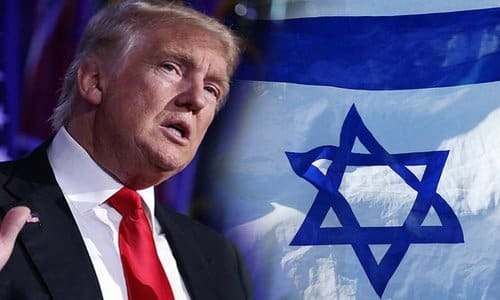 In the midst of all these troubling hints comes a report (from the Axios news site) on Feb. 1 that "The White House is considering presenting President Trump's Middle East peace plan even if the crisis with the Palestinian Authority continues and Palestinian President Abbas refuses to come to the negotiating table . . . "
Yet President Trump and other administration spokesmen have said repeatedly that the U.S. will support whatever solution the Israelis and the P.A. both want. If that's the case, then why should the U.S. present a plan of its own? The only conceivable purpose of an American plan would be to embarrass the two sides and therefore pressure them to agree to the U.S. terms. The last thing that's needed now is yet another American plan that will demand even more concessions from Israel in exchange for unenforceable Palestinian promises. It's time for a U.S. policy based on two principles: first, that Israel has already made enough concessions; and second, that there is value to waiting. Let's wait until the P.A. demonstrates, through deeds, that it is ready for peace. Let's wait until the P.A. outlaws and disarms terror groups, extradites terrorists to Israel and publicly recognizing Israel's right to exist as a Jewish state. Until then, any new U.S. plan is doomed to failure. Originally pubished at JNS.org - reposted with permission.